Hello again this week! 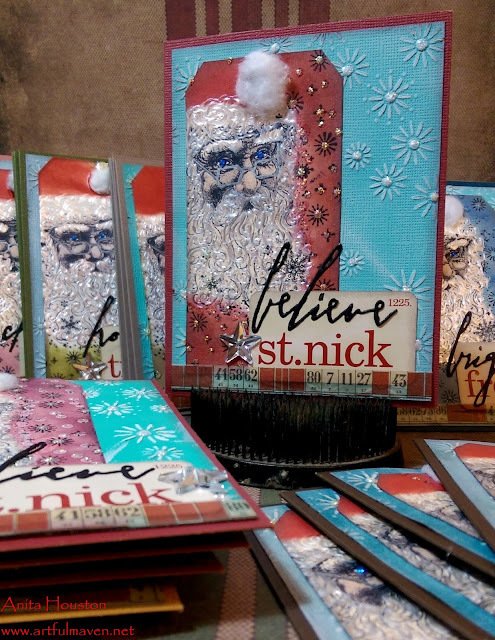 Today, I have a tutorial up on the Ranger Ink blog to make these Nostalgic St. Nick Christmas Cards. I hope you pop on over and have a look to see how I've put them all together...36 of them. Just click on the above link. Thanks so much for looking and commenting! It means so very much! 36 of them? Are you freakin' kidding me? You just made my stomach flip with a panic attack! That's AWESOME for you and horrible for me. OMG...I'm realizing the slack in my giddy-up. I think I might be in reverse. I'm nowhere near ready, but that's okay, because this isn't about me...it's about YOU and you're amazing sense of talent, organizational, and inspiring skills. These cards are FABULOUS!!! 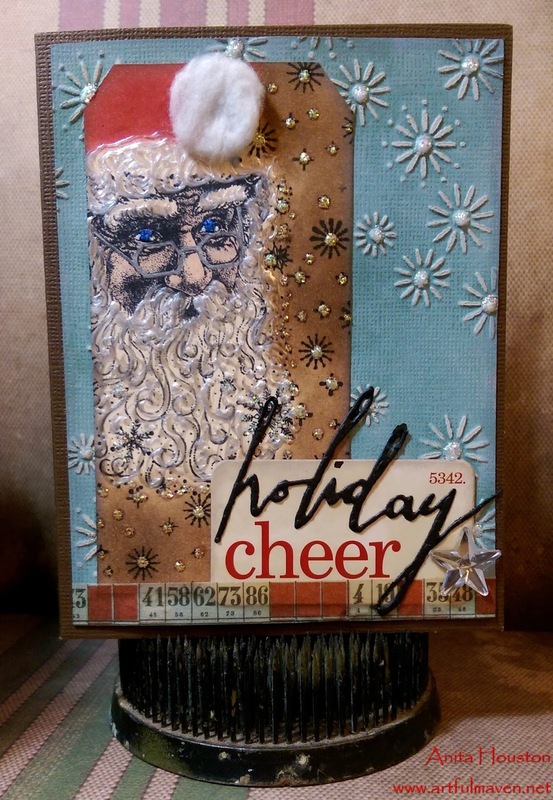 Big hugs to you my friend and it's been a hoot spending time back on your blog. Wow, these are amazing and you are amazing for making all of these!! Wow! What a beautiful card with the St. Nick tag. These are great, the bit of cotton is so clever! Lovely cards, Anita. 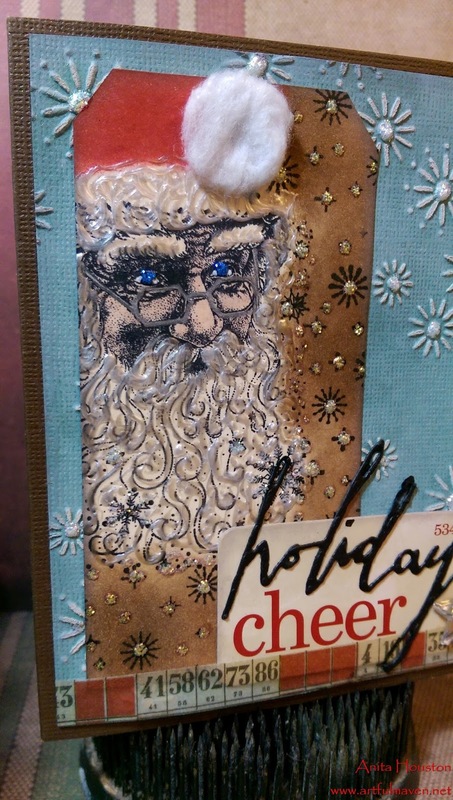 Your Santas are so striking against the blue background. Really beautifully done. These are so amazing, especially because each is unique. They are a gift in themselves! 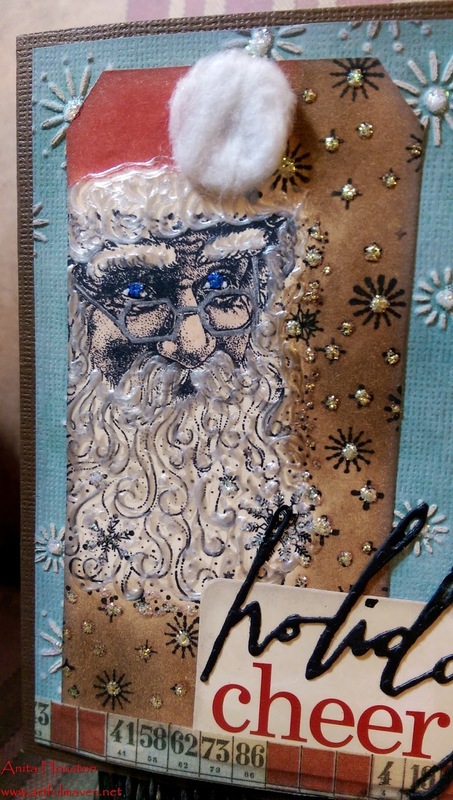 These are so lovely, Anita - I love his sparkling blue eyes, so kind and mischievous at the same time - and the textured snowflakes are so cool both on the coloured tags and on the frosty background panels. Glad you showed the close-ups of the blue/brown version - that is, of course, my favourite!! Anita, the Santa card is so very gorgeous and elegant - love the old familiar image of Santa! Wow love this one!!!! Love the Santa, the snowflakes, well, everything!!! Great job and thanks for sharing!